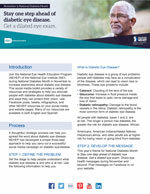 NEHEP has developed social media resources to help you reach people about diabetic eye disease. We have materials you can use throughout the year and a social media toolkit that will help guide your work during National Diabetes Month. Visit the NEI Diabetic Eye Disease Pinterest board. Repin and like pins we post. Pin content that you find useful. Comment on our pins to let us know what you think. Check out our YouTube channel. Watch and share the diabetic eye disease videos, and comment to let us know what you think. Be sure to view all of the NEI eye disease-related videos. Take advantage of social media during National Diabetes Month. Whether you are new to social media or are a long-time user, you’ll find this guide helpful in developing a social media component for your outreach. Post the following National Diabetes Month messages on Facebook and Twitter or create your own. Find photos to include with your Facebook posts in our image library. Be sure to visit the NEI Diabetic Eye Disease Pinterest board during National Diabetes Month. Repin and like pins we post to our boards. Pin content that you find useful. Comment on our pins to let us know what you think. Find more promotional tools in the National Diabetes Month materials in the Resources section of the website.